This Easy Strawberry Rhubarb Pie recipe is near and dear to my heart. It is quick, easy, delicious and a good way to show someone you care. Preheat: Preheat the oven to 400 degrees. If using fresh… remove and discard the leaves from the rhubarb and cut the rhubarb into 1/2 inch pieces. Remove and discard the strawberry hulls. Cut the strawberries into pieces the same size as the rhubarb. If using frozen… thaw and drain the frozen rhubarb and strawberries. Pat dry with paper towels to keep your pie from becoming too watery. Cut the rhubarb and strawberries into 1/2 inch pieces (if not already cut). Make Filling: Add the rhubarb, strawberries, sugar, cornstarch, lemon zest, lemon juice, vanilla extract and salt to a large bowl and stir until well combined. Set aside. Bottom Crust: Unroll one of the pie crusts and put it in the bottom of the pie dish. Press the crust against the bottom and sides of the pie dish. It is ok to have extra pie crust hanging over the edge. In fact, it will make Step 6 easier. Add Filling: Pour the filling into the crust-lined pie dish. Cut the butter into small pieces and distribute evenly over top of the filling (see 0:27 of video for reference). Top Crust: Gently place the second pie crust on top of the pie. *** Then pinch the edges of the bottom crust and top crust together to seal (see :40 of video). Fold over or trim excess crust. Use your thumb to press a decorative boarder around the edge of the pie (also known as fluting). Cut slits in the top of the pie crust to allow for venting during baking. Beat the egg in a small bowl and brush onto pie crust. Sprinkle the pie with a little sugar (1/4-1/2 Tbsp.). Bake: Using 2-3 inch wide strips of foil, cover the edge of the pie to prevent it from burning. Put the pie on a baking sheet and place in the oven for 35 minutes. Remove the foil and return the pie to the oven for an additional 10-15 minutes for a total time of 45-50 minutes. *Get the dough pie crusts. **The rhubarb and strawberries can be fresh or frozen. I haven’t noticed much difference between fresh strawberries and frozen strawberries. Frozen rhubarb is always a safe bet. If you want to use fresh rhubarb, I recommend only doing so when it is in season (summer time). ***You can choose whether to put a design in the pie crust or not. 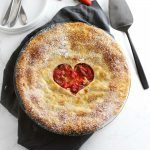 I used a simple cookie cutter to make the heart shaped crust seen in this post but feel free to get as creative and do your own design. If you prefer to have no design at all, just make sure to cut a couple slits in the top of the pie crust to allow for venting while it is baking.